Acne is the most common skin condition in the United States, and comes in many forms. Acne is attributed to a hormonal imbalance, which can affect the function of the sebaceous glands, whose job is it to create sebum, or oil, which travels along the pore to hydrate and protect the skin on the surface. When too much sebum becomes clogged within a pore and pairs with dead skin cells from the surface, bacteria forms, triggering an inflammatory response from the body. The result of that response usually appears as red, swollen bumps known as pimples, a symptom of acne. 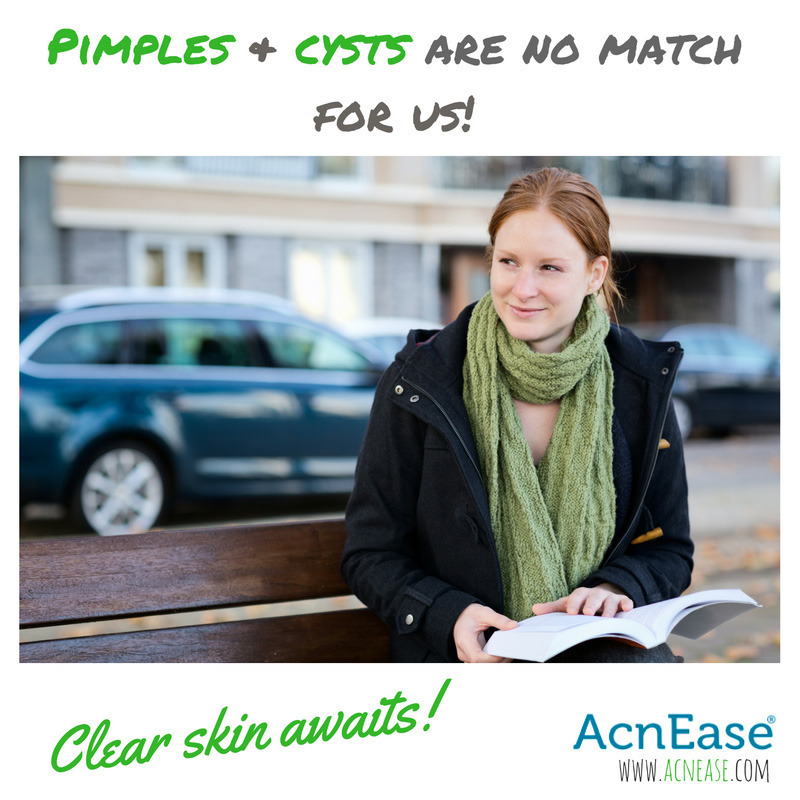 Two common types of acne are pustules and cysts, both a result of inflammation, which can become further triggered by the cool air of the fall months. We’ve put together a quick and easy list of do’s and don’ts to refer to help rid your skin of these symptoms this fall! Learn your acne type. While pustules and cysts are both forms of inflammatory acne, they are quite different in a number of ways, and treating each requires a little something different in order to witness real results. The difference between cysts and pimples lies in where they find themselves on the skin, with pimples above, and cysts forming below the surface. Learning your acne type can help shine a light on which treatment can work best for you. Have patience. Although you may sometimes wake up to a new pimple or cyst, it has actually been forming underneath the surface for days. And if you’ve had acne for over 2 years, treating it will likely take some time. As with any routine or regimen, patience is essential when it comes to skincare, and resisting the urge to over-wash or pop that pimple can actually reduce the risk of creating more acne, especially when it comes to cysts, which are so hard to treat as the spread of bacteria is more common with this type of acne. One way to stay on track is to add an indulgent fall-themed acne treatment facemask, which can easily be created with a few ingredients from the kitchen, like this moisturizing pumpkin mask! Over-wash or load up on many different products. Ads and commercials train us to keep our complexions squeaky clean with products that most likely contain drying ingredients, which can actually end up doing more harm by triggering those sebaceous glands to produce even more sebum to make up for what is stripped away by the ingredients. In the fall months, keeping moisture both inside and outside of the skin’s surface is something everyone should be making an effort to do, so remember to take it easy on the topicals, and try not to wash more than twice daily. Remember to also use products that are non-comedogenic. Forget to moisturize. Most people with oily skin feel like they can skip out on the moisturizing step in skincare, but as much as sebum is to blame for acne, dead skin cells shouldn’t get off the hook so easily, as they are just as responsible for the bacteria which often leads to breakouts. Whether you hydrate from within with the recommended 8-10 glasses of water a day, or from the outside with a daily sunscreen or non-comedogenic moisturizer at night, be sure not to skip this step to give your skin the care and protection it deserves. Neglect your internal health. Just because the days get shorter doesn’t mean our lives get any less busy, and it’s easy to slack on important aspects of our health like maintaining a balanced diet or getting enough sleep, which can actually end up hurting our skin. You can help regenerate skin cells from within by keeping stress levels low with getting enough sleep each night, or reduce inflammation systemically with the foods that you eat, such as honey, garlic, and turmeric, all naturally packed with anti-inflammatory properties. No matter how much care we show the surface of our skin, acne does not go away on its own when it's left untreated. No food, topical or DIY treatment can do it. Symptoms might lessen, but they will almost always come back. Why? Acne is a usually the result of a hormonal imbalance, which occurs from within. Our AcnEase® users are able to experience how a treatment can act as a buffer between the hormones and sebaceous glands so that the sebaceous glands can return to normal activity. The botanical ingredients that make up the various AcnEase® treatments were selected based on years of research and trials as the safest and most effective combination to not only eliminate existing acne symptoms but also prevent new acne from forming, no matter how severe. It is the only natural treatment on the market that PREVENTS acne (with a 96% user success rate), which is KEY to the process of breaking the acne cycle. We want to hear from you! What are some of your favorite acne-free tips for fall? Have any easy at-home masks or recipes you love? Tell us in the comments!